There’s a shake-up going on in Beaujolais that wine lovers should heed. The Beaujolais crus, in particular, are demonstrating that there’s more to the Gamay grape than just Nouveau. A series of successful vintages, including the exceptional 2009, are part of the reason but old vines, a unique terroir and a growing band of diligent and determined producers are also vital factors. Trying to convince consumers that Beaujolais can be serious is not an easy task. Beaujolais Nouveau has held such a stranglehold on taste and communication since the 1970s that it’s difficult to believe the region produces anything other than this light, fruity and rather standardised libation. Indeed, at the height of its success in the late 1980s, Nouveau accounted for more than half of the region’s production. This has now been throttled back to about a third (30 million bottles in 2013) but continues to have an impact on perception. So why get excited about what’s going on in the region? Well, on the grand scale, and mainly due to a downturn in demand, the total vineyard area has been reduced to 16,571 hectares (2013) from a high of 23,000ha in the late 1980s. Consequently, production has been curbed in an bid to assuage the crisis. 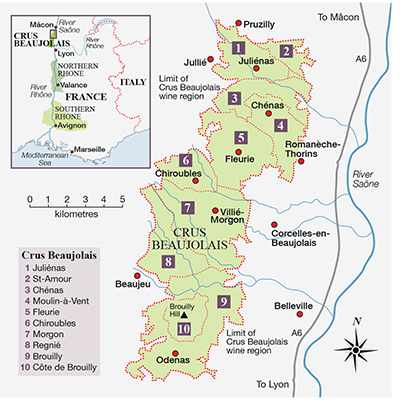 Of most interest, though, is what’s happening in the 6,191ha that constitute the 10 Beaujolais crus. These are located in the north of the region, just south of the Mâconnais, in a strikingly hilly terrain composed predominantly of granite and schist soils. Moulin-à-Vent, Fleurie, St-Amour and the others all have individual identities but their common factor is that they represent the quality end of Beaujolais. This has been somewhat hidden in the past by the influence of Nouveau, a lack of investment and, if truth be told, not enough decent winemaking. But things are changing. On the political and administrative front, the crus have just quit (in December 2014) the body that promotes and manages all the appellations of the region. Under their own banner, the ODG, and led by their spirited president from Fleurie, Audrey Charton, they are taking their destiny in their own hands. ‘We want to have a stronger presence so we can raise the standard of wine throughout the region,’ she says. Locally, this is seen as a seismic decision and could have further ramifications. Of more interest to consumers, though, is what’s different in the glass. What do you get that is above and beyond regular Beaujolais? Well, at their best, these are wines of real personality and character that speak of soil and climate. The grape may be Gamay, but the crus find some resonance with the wines of their Burgundian neighbours to the north and those from the northern Rhône some 70km south. A semi-continental climate and poor, granite-based soils (those in southern Beaujolais are richer and produce lighter wines) provide freshness and structure, the acidity and supple tannins contributing a linear precision and firmness ideally enjoyed with food. Alcohol levels are a reasonable 12.5% to 13%. Aromatically, one can find minerality, for want of a better word, with often a hint of the pepper and spice associated with the northern Rhône. The fruit expression can be red or dark depending on the style of the vintage, the crus with their southerly and easterly hillside exposures ripening earlier than vineyards at the southern end of the region. In short the crus have a delicious smack of fruit but also the structure to age, some resembling a mature Pinot Noir with a few years in bottle. Individual nuances found among the 10 crus is dependent on elevation, exposure and soil profile. Since 2009 a detailed study of the soils has been underway, the results now in the public domain. What has proved to be staggering is the diversity even over a short distance, but in essence the principal soil types are granite, a ‘blue stone’ slate and diorite mix, ancient alluvial stones and limestone. Each cru finds its personality via the mix of these elements, the growers now with a clearer idea of what each parcel contains. The official density of planting for the crus is 6,000 vines/hectare, but in reality the top growers often work with 10,000 to 12,000 vines/hectare, pruned in the traditional, yield-curbing gobelet fashion. The other surprise is the age of the vines. I was amazed to learn the advanced age of many of the vineyards – parcels at Domaine Louis-Claude Desvignes in Morgon range from 60 to 100 years, for instance, while Thibault Liger-Belair quoted 50 to 140 years at his eponymous domaine in Moulinà- Vent. Hand harvesting clearly remains de facto, although machines are now permitted. As for winemaking, some points need clarification. These days the most contentious technique in Beaujolais is not carbonic maceration, where intact bunches of grapes undergo an intracellular fermentation over about a week in a sealed tank of carbon dioxide. Instead, the controversial process is thermovinification, where the grape must is heated to 60°C for 12 hours before being cooled rapidly over about four days. This extracts aroma and colour but leads to homogenisation and wines that are aromatic but dull and short on the palate. Most growers in the Beaujolais crus abhor this technique, relying on one of two other methods instead. The majority practise a form of semicarbonic maceration, whereby whole bunches are placed in a tank and both normal and intracellular fermentation is allowed to take place. Extraction of aroma and colour is obtained by pumping the juice back over the macerated skins, punching down the skins, or racking the juice off and returning it to the tank, in a process lasting up to 15 days. The wines are then aged in a neutral tank or old casks for about a year. The other winemaking process, which is referred to locally as the ‘Burgundian method’, is simply the classic method of fermenting destemmed and crushed grapes. Both techniques work the grape must to obtain structure and substance and take the wine beyond an aromatic burst of fruit. The other implicit influence is that of vintage. Climate still has the final say in ripeness and style of wine and, in recent times, the choice for the consumer has boiled down to later- and earlierripening years. Recent Beaujolais vintages like 2009, 2011 and 2014 were all earlier ripening – 2009 atypically rich and opulent, 2011 concentrated and complex and 2014 looking to be full-bodied and food-friendly. These are the vintages with a modern feel. If you would prefer something along more classical lines, try the later-ripening 2010s and 2013s, which are fine, fresh and structured. Beware of 2012, which was compromised by rain. I mentioned at the outset that investment had been lacking and winemaking could be improved, but here too there has been change. At a judicious level, domaines like Daniel Bouland and Louis-Claude Desvignes in Morgon have in recent years acquired pneumatic presses and this has clearly helped improve the textural quality of their wines. New names and a younger generation have also entered the frame with figures like Jean-Marc Burgaud in Morgon and Claude-Edouard Geoffray at Château Thivin demonstrating technical prowess. On a grander scale there has also been change of ownership, with Burgundy, in particular, investing heavily in the crus. Thibault Liger-Belair from Nuits-St-Georges bought his first vines in 2008 and now has 11ha. ‘People thought I was mad at the time, but land values have since increased by 20% due to demand,’ he says. Other Burgundian growers present in the crus are Frédéric Lafarge of Volnay and Louis Boillot of Chambolle-Musigny. Nor are the serious négociants absent. Jadot acquired Château des Jacques in 1996, but more recently the Henriot family of Bouchard Père et Fils bought Villa Ponciago (2008), Albert Bichot acquired Domaine de Rochegrès (2014) and Joseph Drouhin has just taken over the management of the Hospices de Belleville, which owns vineyards in Brouilly, Fleurie and Morgon. Other investors from outside Burgundy have also acquired holdings, so clearly things are humming. Fleurie, Morgon and Moulin-à-Vent are leading the charge, so keep an eye out for these crus. Above all, remember that if you want authenticity, terroir and character then the Beaujolais crus really can deliver. It’s chalk and cheese compared to Nouveau. James Lawther MW is a Decanter contributing editor, author, lecturer and tour guide.